Explore the newest Lexington horse farms for sale below! Lexington, the Horse Capital of the World, rests at the center of the Bluegrass region of Kentucky. Lexington is known today for the outstanding horses in a variety of breeds that are born, raised, trained, and that compete here each year. And with the area's nutrient rich farms, Lexington horse farms for sale are perfect for those looking to breed champion equines. 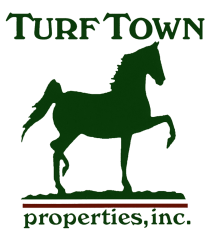 We have several of the best equine clinics in the world, are home of the world renowned Kentucky Horse Park and the Keeneland Racecourse, and are the headquarters of many of the major horse breeds and equine competition organizations. Of course, Lexington has also long been known as the home of the University of Kentucky, UK basketball, bourbon, and for our affluent and friendly lifestyle. I like to say that Lexington is small enough that people are actually nice, yet erudite enough to allow you to do anything that a major city has to offer. Browse Lexington horse farms for sale or find out more about life in Lexington and how it's ranked best of the US! 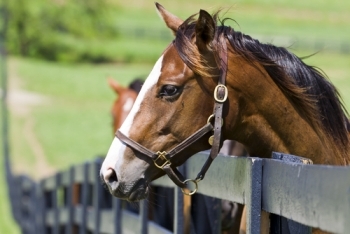 Lexington, KY horse farms for sale are home to some of the world's premier thoroughbred farms. Founded in 1775, Lexington was named in honor of the colonists' victory in Lexington, Massachusetts, in the American Revolution. In 1780, Transylvania University was started by act of the Virginia legislature. Transylvania was the first college west of the Allegheny Mountains. Since 1820, Lexington has also been referred to as the Athens of the West. 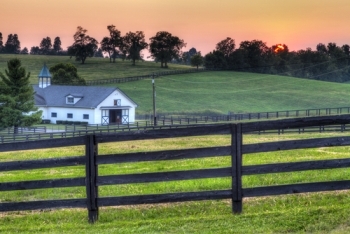 Kentucky still ranks horses as one of the largest cash crops in the state, with Lexington as the home base for many of these farms and horse people. 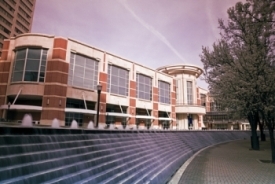 Lexington has attracted international companies from around the world and some of the city's largest employers include the University of Kentucky, Xerox, Lexmark International, St. Joseph Hospital system, Baptist Healthcare system, UPS, Cardinal Hill Rehabilitation Center, IBM, and Tempur-Pedic. Other major employers in the surrounding areas include: Toyota Manufacturing, Eastern Kentucky University, Tokico, Montaplast of North America, and the various state agencies based in Frankfort. Although we have snow each winter, it melts quickly in our more moderate temperature range. We have no prolonged periods of heat, cold, rain, snow, or wind. Our average minimum and maximum temperatures: spring, 34-74F; summer, 61-86F; fall, 36-79F; and winter, 23-54F. In 2010, Lexington had a population of roughly 295,000 people with a total of 645,000 people, including the surrounding counties. The city has a vibrant downtown featuring historic districts, new infill projects, beautiful parks, excellent local restaurants, walking/biking trails, and great art and cultural centers. Urban sprawl is kept to a minimum and city is surrounded by the green pastures of grazing horses. Traffic by most city standards is minimal. You usually can drive from one end of the city to the other in less than 30 minutes, even during rush hour. Lexington horse farms benefit from four distinct weather seasons. Since we sit on the Bluegrass plateau just west of the Alleghenies, our weather tends to be more moderate than other Midwestern locations. We also miss a lot of the heat and humidity of more southerly locations. Just north of Nicholasville and Richmond, Lexington is steeped in a tradition of Southern hospitality. We feature a highly educated work force, low crime, and gorgeous scenery. If you come to visit you will not want to leave!